Our Creamy Chicken Pasta Sides comes loaded with rich, chicken-flavored sauce and carrot garnish, making it easy to take dishes like our Creamy Chicken Primavera Pasta to the next level. 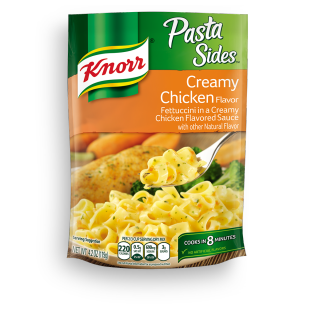 Creamy Chicken Pasta is rated 3.8 out of 5 by 9. Rated 5 out of 5 by imjustgrandma from very goood very good for fast side. a lot like old time mix we used to buy. Rated 1 out of 5 by timskitten from Just No! I did not care for this flavor at all. Made a mistake and bought this instead of the regular Knorr Chicken Pasta Side that I normally get. I like most of Knorr's products so I cooked this expecting it to be fairly tasty, but it is terrible. Has practically no chicken flavor, a weird aftertaste and what on earth is that unpleasant smell that it releases while cooking? Pretty awful.